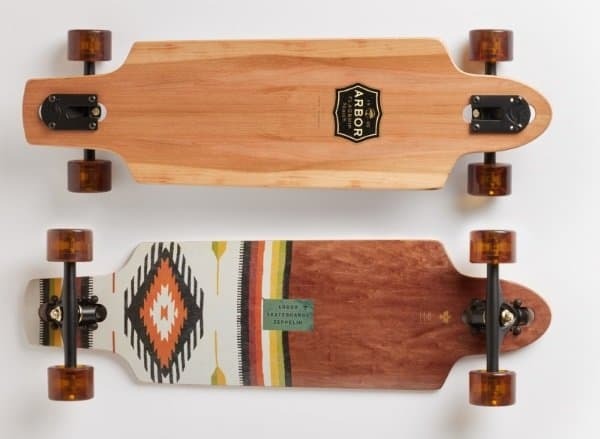 The Arbor Zeppelin is a beautiful-looking drop-through carving and light freeride longboard designed to be lightweight, quick and responsive for campus and city riding. The Zeppelin is a performance drop-through shape that offers exceptional carving capabilities, something generally associated with topmount boards. The mid-length wheelbase and Paris trucks largely contribute to such capabilities. The Zeppelin is short and lightweight enough to be carried around everywhere and easily stashed in a locker or under a desk. It’s drop-through construction and directional shape also make it a very apt commuter and light freeride board. See the Arbor Zeppelin Bamboo version on Amazon. Who is the Zeppelin meant for? As a compact surf-inspired drop-through – a relatively rare design, the Zeppelin is a good option for both beginners and city or campus commuters. On the one hand, the drop-through design keeps the board low riding compared to a topmount, making it easy to push over distances and ride down small hills with stability. On the other hand, the light weight and compact size made the Zeppelin very portable for daily commuting to work, running errands, or getting around campus or the neighborhood. The Zeppelin is more than just a push commuter, though, it’s a true carving and street surfing board due to its shape, wheelbase length and truck choice which give it a large turning radius. The carving adds fun and excitement to the commuting. The Zeppelin also performs well on mild slopes at moderate speed due to the stable drop-through design and the nice concave with uplifted rails which provide a slight amount of foot lock-in. The Zeppelin has a directional, classic downhill tyoe of shape, which is great for pumping and commuting. It has big wheel cutouts providing lots of wheel space, a tapered pointy nose, and a tapered rounded tail. It’s 32″ long and 8.75″ wide, so about the size of a regular street skateboard, but wider and squarer in the middle and much narrower at the tips. Unlike a street deck, the Zeppelin has drop-through mounts – a key aspect of its design. Due to the 2″ tail and 2.125″ nose, the Zeppelin’s standing platform is quite short at under 28″ which can be compared to a mini-cruiser like the Landyachtz Dinghy (a very different, topmount shape). The Zeppelin, though, is proportionally much wider at 8.75″ (vs 8″ for the Dinghy), offering a good-sized standing platform and thus higher foot comfort for longer commutes and faster freerides. The Zeppelin’s deck has a 7-ply hard rock maple construction. The low ply count keeps the board lightweight and gives it moderate flex (compared to thicker, stiffer decks). The slight flex adds to the board’s comfort as it makes it more pumpable and responsive and helps it absorb bumps better. The deck has a slight widthwise curve which help secure your feet when riding faster. This subtle (0.438″) concave also comes in handing for carving, giving you more edge control and leverage in turns. The Zeppelin has been around for many years – it underwent a major redesign in 2015 with changes to the deck’s dimension and even mount style. There are currently two Zeppelin versions, the Flagship and the Bamboo (Amazon) which differ by their top sheet finish and graphic design. Both versions use a premium wood topsheet which perserves the slight snappy flex. The top sheet on the Flagship is a Red Gum Wood Finish Ply, whereas the bamboo version has a “carbonized bamboo finish ply”. A nice thing about the Zeppelin (and all of Arbor longoards) is that they use recycled wood and eco-friendly materials. They use a water-based sanding sealer for production to avoid air pollution. Previous versions of the Zeppelin were designed to use Gullwing Sidewinder trucks, which have a double kingpin pivot system that allows you to really lean in when carving and turn sharp. The newer Zeppelin versions, however, are optimized for 150mm Paris trucks which are excellent carving trucks, quick turning and with great leverage. They allow you to carve serious turns particularly when equipped with 90a Divine bushings. Unlike the Sidewinders, however, the Paris trucks are very versatile and also offer great stability at speed and for long-distance pushing. The 50º baseplate angle provides very good balance between stability and turn. The Zeppelin’s 23″ wheelbase combined with the 150mm Paris trucks results in nice responsiveness for navigating sidewalks and tight alleys. 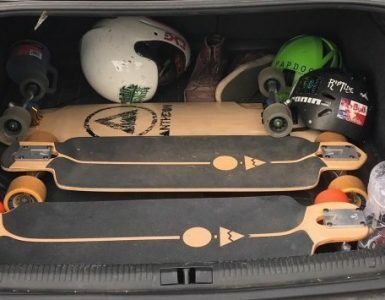 So you get a ready nice maneuverable carving board while enjoying the benefits of the stable and low-riding drop-through shape. 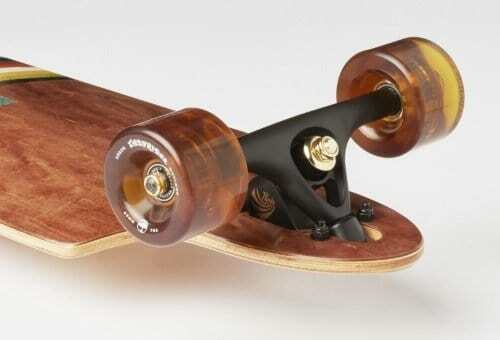 (78A) and grippy wheels with a shock-absorbing centerset core, suitable for carving and cruising. The wheel’s symmetrical profile provides a good balance of roll speed and acceleration, great for commuting. The 36mm contact patch, combined with the board’s drop-through shape, makes it easier to break into slides. 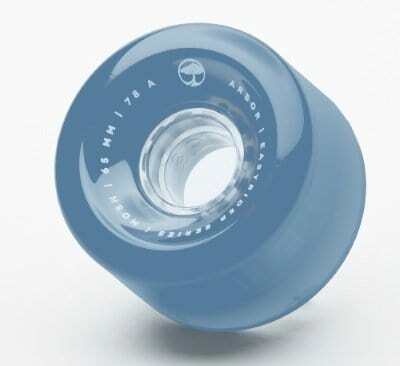 The Arbor wheels come equipped with ABEC7 Biltin bearings which have built-in washers and spacers. They offer very low friction and allow the wheel to roll for a long time. The built-in spacers keep your wheels aligned no matter how loose or tight you set them. The Arbor Zeppelin stands out as a great drop-through carver board for city and campus commuting and city cruising. It’s a lot of fun to carve. It’s comfortable yet snappy and maneuverable for cruising through crowds dowtown thanks to its wheelbase and short Paris trucks. Meanwhile, it’s very stable thanks to its drop-through construction, and portable due to its short size and light weight. 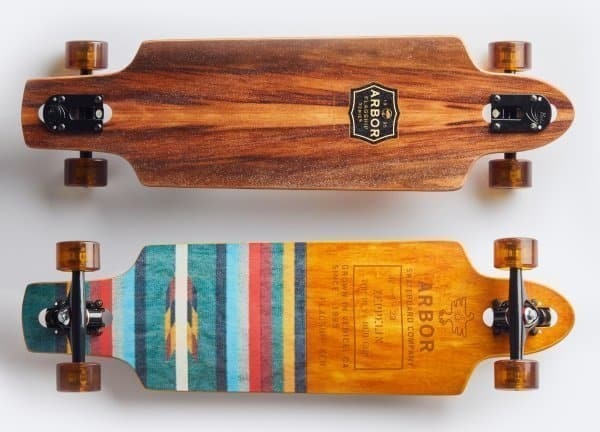 Like most Arbor longboards, it has great build quality. 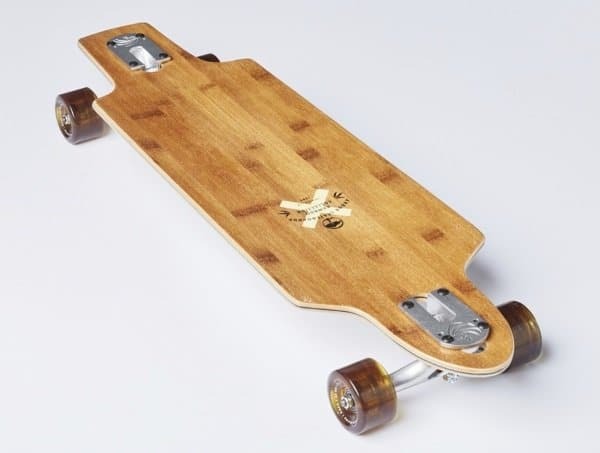 At under $200 for the bamboo version, it’s also a very affordable board and good value for the money.